It's been a weird few months for condiments. First, there was Mayochup. The public was confused but game. Then, however, improbably, Heinz debuted Mayocue and Mayomust. You'd think that after Mayomust, there's no way a company could come up with a weirder name. And yet. And yet, something called Kranch now exists. As to what it is, it's "a mouthwatering mix of ketchup, ranch and a special blend of spices," according to Heinz. Whether it is an abomination in the eyes of the Lord went unaddressed in the statement -- and will be left for you to decide. 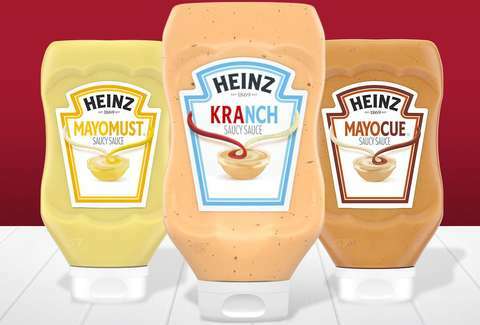 Kranch will be joining the other three condiments of the apocalypse on store shelves and at online retailers this month. If you're behind on all this, Mayocue is a combination of barbecue and mayo, and Mayomust weds mayo and mustard. All of them have a suggested retail price of $3.49. This is starting to seem like the culinary equivalent of combining all the sodas at a restaurant. But maybe it's nice to have the option?